Pakistanis remain in a grim mood about the state of their country. Overwhelming majorities are dissatisfied with national conditions, unhappy with the nation’s economy, and concerned about political corruption and crime. Only one-in-five express a positive view of President Asif Ali Zardari, down from 64% just two years ago. As Pakistani forces continue to battle extremist groups within the country, nearly all Pakistanis describe terrorism as a very big problem. However, they have grown markedly less concerned that extremists might take control of the country. Last year, at a time when the Pakistani military was taking action against Taliban forces in the Swat Valley within 100 miles of the nation’s capital, 69% were very or somewhat worried about extremist groups taking control of Pakistan. Today, just 51% express concern about an extremist takeover. 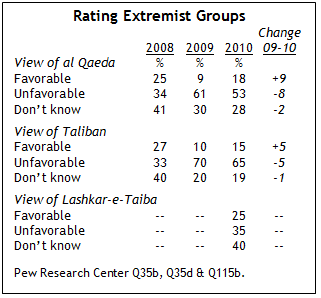 Nonetheless, both the Taliban and al Qaeda remain unpopular among Pakistanis – 65% give the Taliban an unfavorable rating and 53% feel this way about al Qaeda. Negative views toward these groups have become a little less prevalent over the past year, while positive views have crept up slightly. Still, opinions are much more negative today than was the case two years ago, when roughly one-third expressed an unfavorable view of both groups, one-quarter gave them a positive rating, and four-in-ten offered no opinion. Pakistanis express more mixed views about another militant organization, Lashkar-e-Taiba, a Pakistani group active in Kashmir that has often attacked Indian targets (it is widely blamed for the November 2008 Mumbai terrorist attacks). Just 35% have a negative view of Lashkar-e-Taiba, a much lower percentage than for the other extremist organizations tested. One-in-four Pakistanis express a positive assessment, while 40% offer no opinion. Essentially, views toward Lashkar-e-Taiba resemble Pakistani views about the Taliban and al Qaeda prior to 2009, when the balance of public opinion shifted from indifference to opposition to those groups. America’s overall image remains negative in Pakistan. Along with Turks and Egyptians, Pakistanis give the U.S. its lowest ratings among the 22 nations included in the spring 2010 Pew Global Attitudes survey – in all three countries, only 17% have a favorable view of the U.S. Roughly six-in-ten (59%) Pakistanis describe the U.S. as an enemy, while just 11% say it is a partner. And President Barack Obama is unpopular – only 8% of Pakistanis express confidence that he will do the right thing in world affairs, his lowest rating among the 22 nations. Moreover, support for U.S. involvement in the fight against extremists has waned over the last year. Fewer Pakistanis now want the U.S. to provide financial and humanitarian aid to areas where extremist groups operate, or for the U.S. to provide intelligence and logistical support to Pakistani troops fighting extremists, although about half of those surveyed still favor these efforts. There is also little support for U.S. drone strikes against extremist leaders – those who are aware of these attacks generally say they are not necessary, and overwhelmingly they believe the strikes kill too many civilians. The U.S.-led war in neighboring Afghanistan is widely opposed by Pakistanis. Nearly two-thirds (65%) want U.S. and NATO troops removed as soon as possible. And relatively few Pakistanis believe the situation in Afghanistan could have a serious impact on their country: 25% think it would be bad for Pakistan if the Taliban regained control of Afghanistan and 18% say it would be good; 27% think it would not matter and 30% have no opinion. Nonetheless, despite the prevalence of negative opinions about the U.S., most Pakistanis want better relations between the two countries. Nearly two-in-three (64%) say it is important for relations with the U.S. to improve, up from 53% last year. Spring 2010 Pew Global Attitudes Survey, which included 22 nations. 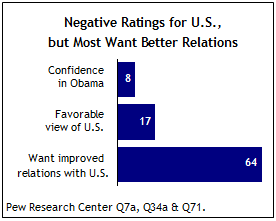 For more findings from this survey, see “Obama More Popular Abroad Than at Home, Global Image of U.S. Continues to Benefit,” released June 17, 2010). While Pakistanis express serious concerns about the U.S., they also have deep worries about their neighbor and longtime rival India. Indeed, they are more worried about the external threat from India than extremist groups within Pakistan. 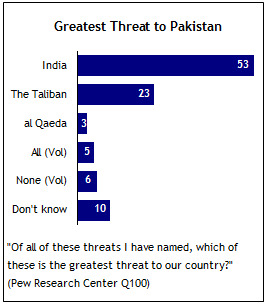 When asked which is the greatest threat to their country – India, the Taliban or al Qaeda – slightly more than half of Pakistanis (53%) choose India, compared with 23% for the Taliban and just 3% for al Qaeda. However, despite the deep-seated tensions between these two countries, most Pakistanis want better relations with India. Roughly seven-in-ten (72%) say it is important for relations with India to improve and about three-quarters support increased trade with India and further talks between the two rivals. Few Pakistanis are happy with the state of their nation – only 14% are satisfied with national conditions, while 84% say they are dissatisfied. Views of the economy are almost as grim. More than three-in-four (78%) say the country’s economy is in bad shape. Moreover, there is growing pessimism about Pakistan’s economic future. Half of the public expects the country’s economic situation to worsen over the next 12 months, up from 35% in the 2009 survey. Almost all Pakistanis say the lack of jobs is a major problem facing their nation, although economic issues are not the only challenges widely perceived. Vast majorities characterize terrorism, crime, illegal drugs, political corruption, the situation in Kashmir, and environmental issues as very big problems. The gloomy national mood has clearly had an impact on evaluations of President Zardari – just 20% have a favorable view of him, compared with 64% in 2008 and 32% in 2009. Even among his own political party – the Pakistan Peoples Party (PPP) – fewer than four-in-ten (38%) express a positive opinion of Zardari. Other leaders receive higher marks, however, including Prime Minister Yousaf Raza Gilani, who is also affiliated with PPP. Most respondents have positive views of Chief Justice Iftikhar Muhammad Chaudhry and cricket-star-turned-politician Imran Khan. Among the political figures tested, opposition leader Nawaz Sharif receives the highest ratings – 71% have a positive opinion of the leader of the opposition Pakistan Muslim League (PML-N). General Ashfaq Parvez Kayani, head of the Pakistani Army, is also generally well-regarded, with 61% voicing a favorable view of him. More broadly, the Pakistani military is overwhelmingly popular: 84% of Pakistanis say the military is having a good impact on their country. And, on balance, Pakistanis tend to support the army’s ongoing efforts to fight extremist groups in the FATA and Khyber Pakhtunkhwa: 49% approve of these efforts, while just 20% oppose and 30% have no opinion. More than four-in-ten Pakistanis see a struggle taking place between Islamic fundamentalists and groups that want to modernize the country; and the vast majority of those who do see a struggle identify with the modernizers. Nonetheless, many Pakistanis endorse extreme views about law, religion and society. More than eight-in-ten support segregating men and women in the workplace, stoning adulterers, and whipping and cutting off the hands of thieves. Roughly three-in-four endorse the death penalty for those who leave Islam. Thus, even though Pakistanis largely reject extremist organizations, they embrace some of the severe laws advocated by such groups. Still, Pakistanis differ sharply with the Taliban and al Qaeda when it comes to a tactic associated with both groups: suicide bombing. Fully 80% of Pakistani Muslims say suicide bombing and other forms of violence against civilians can never be justified to defend Islam, the highest percentage among the Muslim publics surveyed. As recently as six years ago, only 35% held this view. There is no consensus among Pakistanis about the size of American assistance to their country – 23% believe the U.S. provides a lot of financial aid, 22% say it provides a little aid, 10% say hardly any, and 16% believe the U.S. gives Pakistan no aid. Attitudes toward China remain positive – 84% consider China a partner to Pakistan. Over the last five years, Pakistani Muslims have become less likely to believe Islam plays a major role in the country’s politics. Currently, 46% say it has a large role, compared with 63% in 2005. The dispute over Kashmir remains a major issue. Roughly eight-in-ten say it is very important that Pakistan and India resolve this issue, and 71% rate it a very big problem. Pakistan’s often freewheeling media gets high marks from respondents – 76% say it is having a good influence on the country.